Are you looking to install a new garage door? Do you want a few maintenance services on your current garage door? Are there are some damages on your garage door that require the best experts to repair them? Well, if you are looking for the best garage door service Reno, Nevada, you have come to the right place. Reno, sparks, Verdi, Incline Village, Spanish Spring, Cold Spring, Stead, Washoe Valley, Ernley, Arrowcreek, Mount Rose. Garage doors are frequently used in the home or business. As such, they are prone to a lot of damage and that’s why you should have a good garage door repair company ready whenever the problem comes in. If you are looking for the best garage door company in Reno, you should hire Garage Doors Reno & Sparks. Here are some of the most common garage door problems that we can help you repair effortlessly. A simple garage door has 2 different types of springs. First there are the torsion springs which are usually mounted above the garage doors. Secondly, the next type is the extension springs found on either side of the garage door. The torsion springs are used mostly on heavy garage doors while the extension springs are used for lighter doors. Does your garage door stop in the middle of opening? Does it descend faster than usual? Does it hang crookedly? Well, these are some of the signs that both set of garage door springs need to be adjusted or replaced if necessary. It’s prudent to inspect the springs regularly to check whether they are wearing out or if they are too elongated. If you’re unsure of how to check the springs, contact us on (775) 500-1009 and we will send one of our trusted professionals to check the springs for you. Next, he will diagnose the issue and advice on whether you need to adjust or repair the springs accordingly. When you open or close your garage door, it’s easy enough for it to glide on the tracks because of the rollers. However, if they are broken or bent, you garage door will have issues gliding properly. One of the signs that your garage door rollers might be damaged could be a lot of noisy or squeaking when you are opening or closing it. However, if you do some manual inspections, you will also reveal some problems. To avoid damaging the tracks, you need to replace or repair the rollers. Note that, replacing the garage door tracks would be more costly than replacing the rollers so you need to act fast. However, with our expertise on handling garage door rollers, rest assured that your tracks will not be damaged and your garage door can continue gliding softly when opening or closing. When raising the garage door, the cables work together in a pulley system. However, there are cases where cables might snap suddenly especially after wearing out for a long time. The garage door cables are not expensive. However, replacing them on your own might be hazardous especially because garage doors are very heavy. That’s why whenever you notice any wearing out on the garage door cables you need to contact us immediately. We have necessary tools required to hold the weight of the garage doors and replace the cables without damaging the door itself, the floor below it or anyone near it. If you have installed automatic garage doors, they rely on electric openers when opening or closing. It’s quite often that your garage door opener might malfunction and it would be impossible to open the garage door on your own without it. Note that, to fix the broken garage door opener, you need some electrical training. Therefore, don’t damage it further by doing it yourself without the necessary training. Call us immediately and we will fix the issue effortlessly. Garage Doors Reno & Sparks is the first stop for any garage door services. If you are located in Reno and Sparks, Nevada, you can always count on these experts providing the most professional garage door installation, maintenance and repair services to serve your needs. Here are some of the reasons why we are the best in the niche. 1. Trustworthy We are a family owned and operated garage door company. Therefore, you can count on trustworthy service from the top to the bottom. Contact us (775) 500-1009 and talk directly to the owner. We treat every customer as family and are ready to provide the best services that guarantee top notch satisfaction. Contact us today and let us help you with your garage door needs. 2. Licensed And Certified We are licensed and certified to offer various types of garage door services to our clients. With our certification and licensing, you can rest assured that we work with the industry standards. Therefore, regardless of the garage door you might have, we know how to handle it without any issues. If you contact the local licensing board, you will find that we have had no disciplinary issues over the time we have been in business and we are good fit to handle your garage door projects. 3. Experience And Reputation Being the best doesn’t come easy and that’s why we are reputable in the business. Serving the greater Reno and Sparks area in Nevada, we have been in business for the longest time during which we have become trusted by various clients in the area. With our experience, our expertise has increased in handling different types of garage doors so you can rest assured that yours is in the best hands. If you ask for a referral to the best garage door company in the area, our name will definitely come up. 4. A Wide Array Of Services It would be quite disappointing if you had to hire a different garage door company for any service you need. Well, we reduce the hassle for our customers by offering a wide array of services under one roof. Therefore, if you need installation, repair or maintenance services for your garage door, you can get it from our company effortlessly. On the other hand, we handle both residential and commercial companies. Therefore, you can hire us for your home and business garage door needs without any doubt. 5. Favorable Working Hours It would be quite disappointing if you had to wait for a long time to get emergency garage door services because the company has strict working hours. Well, that’s not the case with our company. We work 24/7 and are available to all our clients around the clock. Therefore, whether it’s an emergency service or a simple repair or installation, we are here for you. Simply contact us and we will dispatch our best professionals to your location immediately. On the other hand, we can guarantee a fast turnaround for whatever project without compromising on the quality of services offered. 6. Affordable If you do a simple request for estimates on various garage door projects from our competitors, you will get unbelievable prices, even with some hidden costs attached. However, we strive to offer competitive prices to our customers without a doubt. If you contact us, we will dispatch someone to your location who will assess the issue and come up with the right price. We will not assume the cost of the project over the phone because we want to get it right. There are no hidden costs and we will offer the most affordable prices for whatever project it is. In conclusion, over the years we have been in business, we have grown to prioritize the needs of our customers to make sure everyone is satisfied. 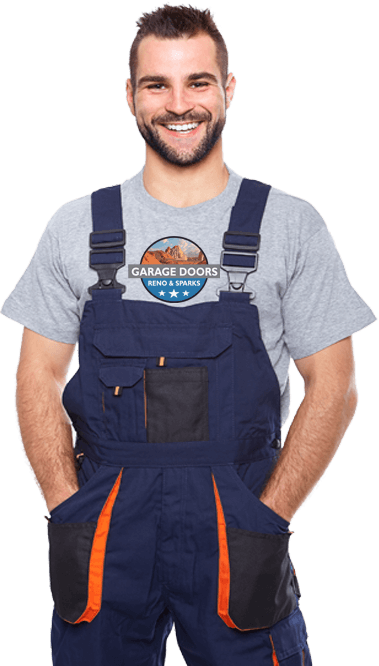 Visit our website https://www.garagedoorsrenosparks.com/ or contact us (775) 500-1009 and one of our professional garage door experts will speak to you. Garage Doors Reno & Sparks is a family owned garage door service company. We handle all types of garage door services such as installation, repair and maintenance. Our top priority is our customers and that’s why we strive hard to make sure that everyone is satisfied with our services. We are very affordable and offer the best types of services at the highest quality. Whether your garage door has been damaged in the middle of the night or in the early hours of the morning, feel free to contact us to fix it for you. Our emergency garage door services are appreciated in the area especially since we work 24/7. Contact us today on (775) 500-1009 or scroll our website today to learn more about our top notch services.